Revenge Is has been one of my favorite t-shirt brands for a long time now. I love what they stand for and I love the quality of their shirts. Their two main themes are endangered animals and eat your veggies. Of course as a soon to be dietitian, I especially love the veggie theme. For my review this time, I chose the "Eat Healthy" Broccoli shirt and the Exploited African Elephant shirt. Both of these shirts are extremely soft and great quality. I love that they are v-neck which is my favorite style. The shirts are both fitted and flattering. 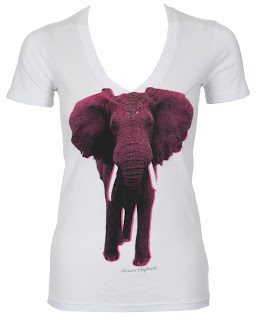 The elephant shirt shows a purple elephant and has some glitter on it. The shirts are made from 50% cotton and 50% recycled plastic bottles! The health benefits of broccoli along with the easy availability of this super vegetable make it one of our most popular veggies. Broccoli provides a high amount of vitamin C and 3 grams of dietary fiber in one cup. In addition to satisfying the daily requirements of vegetable intake, broccoli is just delicious! I love that this company would focus a whole line on vegetables. I also have the mushroom t-shirt and the bell pepper one. My favorite t-shirt of the ones that I have reviewed is definitely the wolf t-shirt. It has a flattering cut and wolves are my favorite animals (tied for monkeys). I honestly love this brand and cannot say enough great things about them. If you are looking to buy a t-shirt with a great message, look no further than Revenge Is.